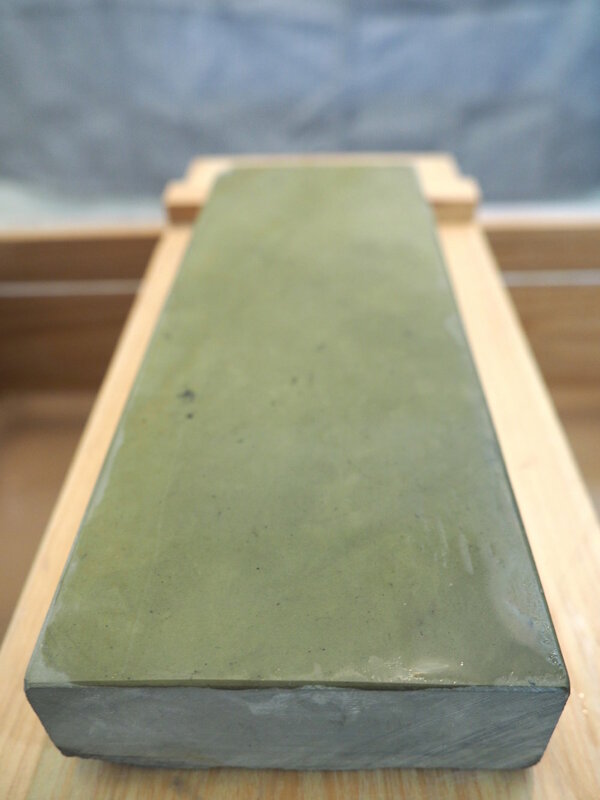 Below are photos of our current lineup of natural stones from around the world that we use to sharpen your tools and knives when selected as a sharpening option. Click on the photos to read a more in-depth “Stone Session” to learn about each stone's unique characteristics, the sharpening experience and results each stone yields on different steels. Information on natural (and synthetic) stones can be a bit overwhelming especially because there aren’t always global agreements on definitions of things (and certainly confuses us at times), but we've done our best to make this special part of the cutlery world as approachable as possible, in hopes you'll get as excited about it as we do. We've broken our collection up into groups beginning with stones that are used mainly for knives (and other larger blades), and then mainly for razors (there certainly can be overlap with stones used in knives and razors, but we've put them in the category we use them most for), with their places of origin, and roughly ascending grit ranges. These Stone Sessions should only be taken as a general refernce, as it is important to note that since these are natural stones, it is very possible that every single stone, even quarried from the same strata at the same quarry, can be different from each other in their idiosyncratic characteristics. Therefore it may be likely that if you have some of the same stones as listed below, you might find that you have different experiences and results with them. 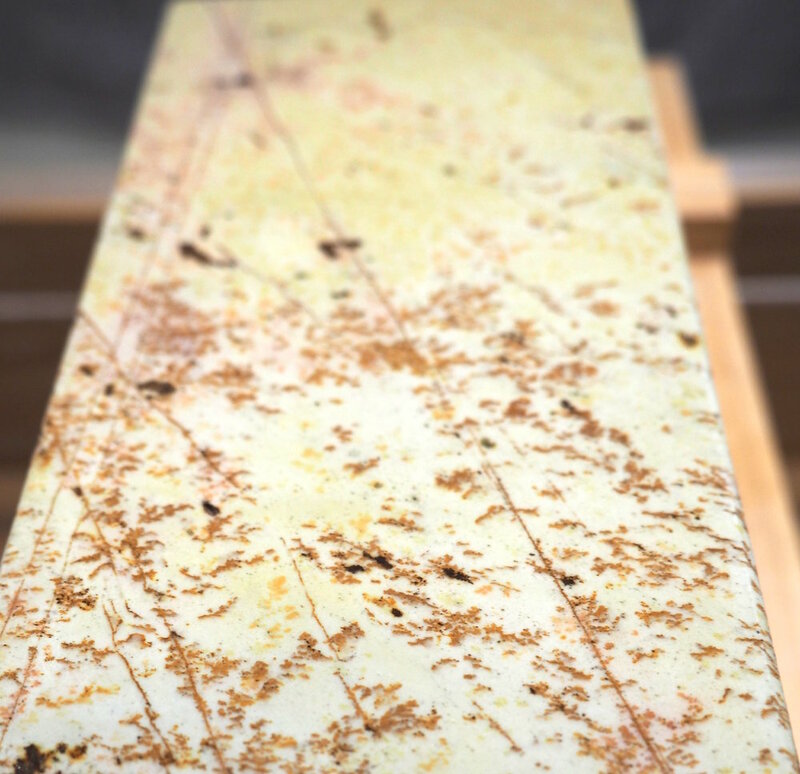 This may be frustrating for some, but it really speaks to how special natural stones can be — it is a relationship that takes time to develop a truer understanding of how your stone will interact with your steels, and how you will interact with both of them. Stones are generally measured in mm as done below, but the density has been given in cm3 for a more digestible number. An initial slurry was only worked up on stones that could benefit from one, and if so, are indicated in the notes. This information may be superfluous for some, but from a novel educational standpoint, it can be useful to gain an initial understanding to the mysterious world of natural stones; albeit, the best way to understand is to get your hands dirty. Please see the expandable sections for further elaboration on some of details and technical jargon used in these Stone Sessions, and the cutlery and whetstone world in general. In order to provide a broad spectrum of steels as succiently as possible, the steels listed below represent three widely common types of steel in the cutlery world - softer (~54-58 HRC) "Western" stainless steels (SS), and two of the most traditional harder Japanese steels, an 'pure' steel, Shirogami, AKA, "white paper steel" and a heavily alloyed steel, Aogami, AKA, "blue paper steel" (both ~60-67+ HRC). Shirogami is a very unadulterated steel, with essentially just high amounts of carbon (~0.8-1.35%), and iron, with as little trace alloys as possible, which allows it to take an extremely keen edge with the downside of it being relatively brittle. Aogami is a more complex steel with a huge amounts of carbon (~1.05-1.5%), as well as a number of alloys, such as tungsten, vanadium, and manganese, which gives it extended edge retention and toughness, with the downside of it not being able to achieve as keen as an edge relative to shirogami. There are different versions of both shirogami (1, 2, and sometimes 3) and aogami (super, 1, and 2), each with differing amounts of carbon and alloys to give them subtly different properties, as well as different types of SSs that differ in both their alloy composition and quality. The versions used below are shirogami 2, and aogami 2, which are typically the most common forms of both, and the SS is from K Sabatier, which in my opinion, is the best French 'Sabatier' brand still in production today. SSs are defined by containing at least 13% chromium, but can have carying degrees of carbon, and other alloying elements. There are many different ways to test for hardness, but the most common in cutlery is the Rockwell Scale, specifically scale C, or 'HRC'. A diamond tip is indented into the steel with a heavy load, and the depth of penetration is measured to yield an HRC number against an intial control depth of lighter load. The higher the number, the harder the steel. Quality steels in cutlery typically range from 54-67+HRC, with some even pushing the boundries close to 70HRC. Some makers mention the HRC of their knives and tools (typically within a small range), while others, especially cheaper brands, do not. The steels used here are likely in the range of, 54-56HRC for the SS, 62-64+ for the shirogami and aogami. While hardness means a sharper edge can be acheived (as well as take on numerous specialized edges), it also means a more brittle edge, and care must be taken when using harder steels as to prevent chips, etc; softer steels can not take as keen an edge, but are tougher ie, they resist chipping and breaking, but loose sharpeness more quickly than harder steels (and are generally limited in the edge types they can take) - pick your poison. It is therefore in your best interest to do some research on what hardness and steel types work best for you when choosing a quality blade. It should also be noted that while steel types are surely important, the heat treatment (HT) of the steels by the smith or maker, can be even more important in the performance of the blade when all is said and done. The subject of HT is beyond the scope of these Stone Sessions, and it is assumed that the steels used here are of quality HT (which they are). The characteristics listed for each stone, except the numerical measurements, are mostly subjective. The more you get your hands on stones and see how other users have classified similar stones, the better picture you have to work with, and the easier it is to discuss such things with a good degree of confidence that you are on the same page. This can get a bit complicated because there can be different 'versions' of the same natural stones, such as being in the same strata, but from a different mine, or being from the same strata but with different aesthetic qualities that may also have subtle differences in their sharpening performances, most of which have a words to designate them as such (such terms will be defined as they arise). Additionally, types of rock, eg, metamorphic, sedimentary, etc, differ from place to place, eg, Japan vs Belgium vs US, etc (or even within the same country), and each country will have its own terms and definitions to describe their respective stones. The most complicated/ most defined are Japanese stones, which is also the most stones from one country that we have. 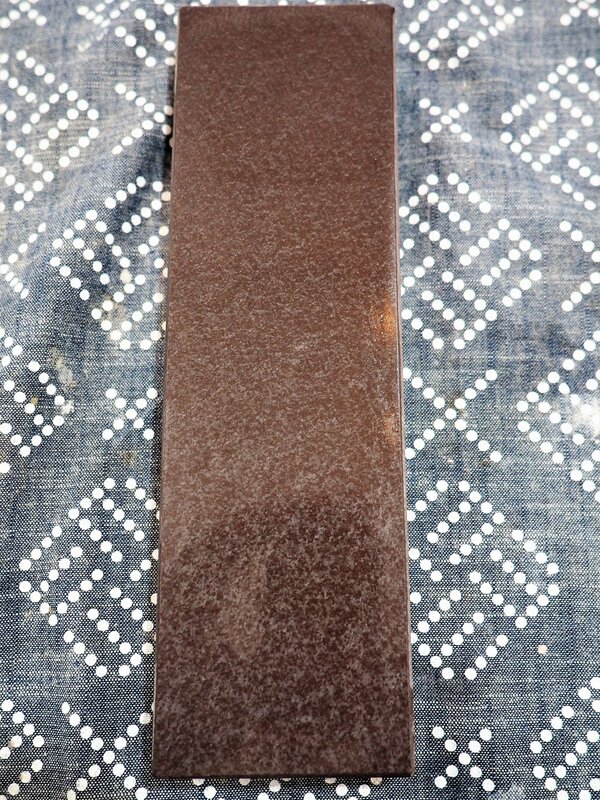 We will focus primarily on Japanese stones. Hardness levels are typically assigned 1-5 (or 1-10), with half numbers in between, 1 being very soft, and 4 (or 10) being very hard, some even add +, and ++ to further specify. Tyically softer stones have certain characterisitcs that make them beginner friendly such as they can 'absorb' mistakes by the sharpener rather than the blade taking the impact and possibly ruining the edge as may happen on harder stones, as well as having greater tactile feedback, giving you a better sense of your angle and pressure. Softer stones also release their abrasive particles easier when in contact with the steel being sharpened, and create mud and swarf (togidoro), which can be utilized by the sharpener by maintaining or adding water levels to create different consistencies of muddyness to yield different results on the edge or surface of the blade. Harder stones do not give up their abrasive particles as easily, but yield very keen edges for knives (or razors, chisels, and planes) with a high HRC, where keenness is paramount. Just like denser water floats to the bottom in a jar of oil, the hardness and density of sedimentary stones usually depend on the strata they are mined from, with deeper strata stones being harder than top strata stones. Hardness is also be dependent on the form of earth the stone has taken. 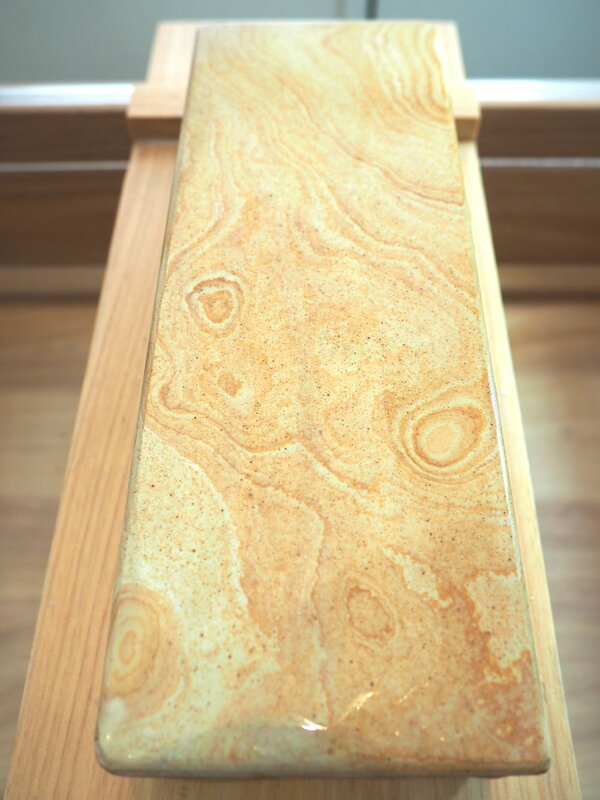 In Japan nearly all the stones are a type of sedimentary sandstone, while the classic Arkansas stone is a form of very hard chert; yet another variable to consider with natural stones. Each stone, with its own grit and hardness, has its own place in a sharpening series, and work better on some steels than others, and are ideal finishers for some types of knife designs and tasks. Learning how all these factors (plus several not mentioned), is what is so endlessly entertaining and intriguing about whetstone sharpening. 'Grit' is defined as the approximate number of small abrasive particles per square inch of the stone. With increasing grit numbers, the abrasive particles become more numerous per square inch, while becoming smaller and smaller (measured in microns), and vice versa. 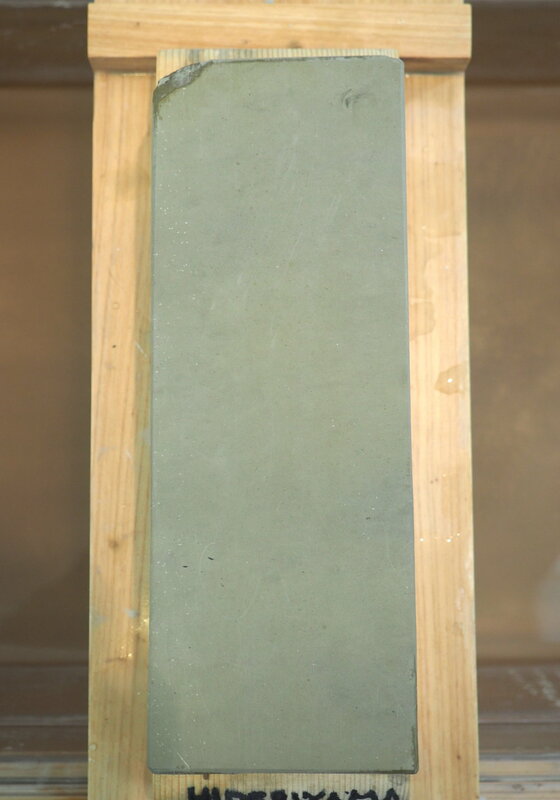 This explains why a lower grit stone will provide a toothy edge - because the abrasive particles acting on the edge of the blade are larger, and remove bigger chunks of metal, thus creating a textured, saw-like 'toothy' edge, VS a finer grit stone where the particles are smaller and remove less metal, thus leading to a smoother, 'keener' edge. All grit numbers are in JIS ('Japanese Industrial Standard,' instead of, ANSI 'American National Standards Institute,' the latter being what you find on sandpaper, etc, at the hardware store in the US) which is the standard for Japanese whetstones, and in the specialty cutlery world in general. Given that these are natural stones ie, they do not come with exact measured grits like synthetic stones, it is best to give an estimated grit range rather than assume an exact number. Natural stones can range from anywhere from a gnarly 300 to a wicked 30,000+. The size of the particles are typically dependent on the strata they originate from, usually the deeper the strata, the more time (ie, millions of years) they have had to sink to the bottom and erode, leading to finer grits, and vice versa, and harder, denser stones. The type of abrasive particles themselves vary in type depending on the composition of the earth where they are mined, which is an interesting field to study in itself, but beyond the scope of Stone Sessions. But, the vast majority of abrasive particles in natural stones contain some form of silicate (typically quartz), especially in Japan, as well as the classic Arkansas stones where it is in the form of novaculite. Belgium whetstones on the other hand, are famous for their spessartine garnet particles, which are very hard and do not breakdown during the sharpening process. Synthetic stones contain extremely hard particles such as aluminum oxide, chromium oxide, etc. at measured grits, which results in very efficient, reliable, and consistent stones, especially in the lower grit ranges, but honestly do not contain the wonder of natural stones. Although it is beyond the scope of Stone Sessions due to the endless complexity of the subject, stones can be rubbed with other stones of different grits, called nagura (or of the same grit, 'tomo nagura'), or diamond stones to free up more abrasive particles. This mixture can be further diluted with different amounts of water, to create innumerable combinations of different grit ranges and consistencies, which yield remarkably varied finishes on quality blades; such is the magic of natural stones. More of our stones coming soon!